3 Buildings + 2 Parking Lots on Busy Corner! 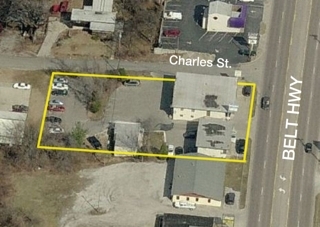 Three office/commercial buildings totaling 9,200SF+/- of net rentable area. Immediate income from current tenants and additional space to occupy or lease. Easy access and high visibility on corner location fronting South Belt Highway. Well maintained 3BR, 1.5 BA Ranch Sells Regardless of Price! Cozy 3 BR ranch on quiet, treed cul-de-sac block with large fenced yard, beautiful wood burning fireplace, hardwood floors and replacement windows makes a great starter home or investment opportunity. Sells regardless of high bid! 3 BR, 2.5 BA, 1.5 story Colonial home with circular drive in Kansas City North. This well maintained gem has an all new electrical system, newer HVAC, hot water heater, roof & gutters. Beautiful hardwoods and tile. Absolute, No Minimum Bid! Well maintained raised ranch has 3 BR, 1.5 BA with a fenced yard full of mature trees. Convenient to shopping and highway access & city parks. A large detached motor home garage with electricity would make a great workshop. No minimum bid! Spacious Custom-Built Ranch Surrounded By Black Hoof Park and Lake Lenexa. No Reserve! Beautiful, gated executive home on 9 secluded acres. Open floor plan, 4 bedrooms, apartment-style suite, 4.5 baths, two kitchens, sunroom, private-entry office and full bath, huge laundry and sewing room all on one level. No minimum bid! Maintenance free exterior Bolling Heights 3-bedroom 2 bath ranch has huge living room, dining room, eat-in kitchen, full finished basement, screened 'Summer House' & garden shed. No Minimum Bid! The perfect farm for country living close to town! 56 acres+/- with 1400sf, 3BR/1BA all brick ranch home (needs work). 2 full silos, 1 small silo, hay barn, calf barn, 1,000 gal propane tank. Cross fenced. Beautiful farm and potential home site! 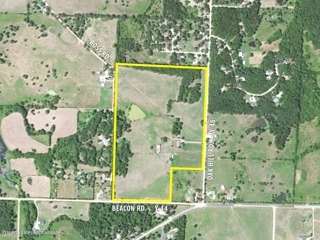 81 acres+/- in multiple parcels includes barn, live spring and creek. Fenced. Easy access from Hwy 52 & Y Road. 4 Bedroom / 4.5 Bath Home w/4 Garages -- No Minimum Bid! Approximately 3400sf home on corner lot w/4 bedrooms, 4.5 baths, 2 fireplaces and 4 garages! Finished walk-out basement has large wet bar. Needs updating but spacious and well maintained. Newer roof & gutters. Sells regardless of price! 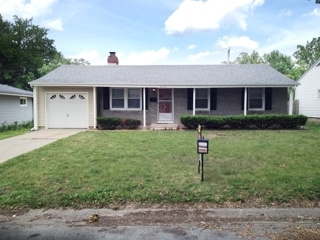 3 Bedroom All Brick Ranch - No Minimum Bid! Never before offered! Well-built all brick 3BR/2.5BA ranch home with side entry garage and partially finished basement. Nice large lot on a quiet newly re-surfaced street in Fulkerson Estates. Well maintained; needs updating. Sells regardless of price! Tract A. 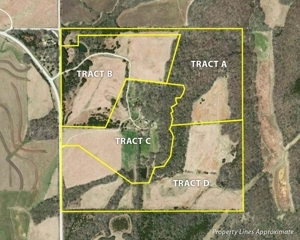 35 Acres Mostly Timber w/Pond; Tract B. 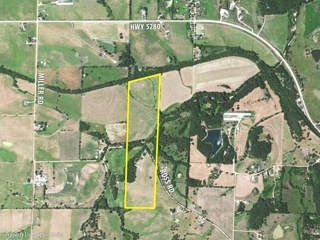 36 Acres Mostly Pasture; Tract C. 34 Acres Timber & Pasture w/Renovated 1.5 Story Home, Stone Barn, Log Corn Crib, Silo, Pond; Tract D: 55 Acres Mostly Pasture w/Some Timber. Come And Bid Your Price! Adorable home has 4 oversized BR, 2 newly renovated BA, living room, family room, rec room, eat-in kitchen w/large picture window & a newly finished basement. A large bay window looks out to the beautiful treed .8 acre lot. No minimum bid! Come and bid your price on this solid 4 bedroom, 2.5 bath, 2 story home with living, dining & family rooms, wbfp, eat-in-kit., finished basement, fenced back yard, steel siding, new roof & gutters, 1 year home warranty & more! Come and bid your price on this solid 3 bedroom, 2.5 bath, true ranch with living, dining & family rooms, wbfp, eat-in-kit., full basement, fenced back yard, 2 car att. garage, det. garage/workshop, corner lot, 1 year warranty & more! Real Estate has sold prior to auction. Auction has been cancelled. 3 bedrooms, 3 baths, living room, family room, breakfast nook, office, 2 garages and finished walk-out basement. 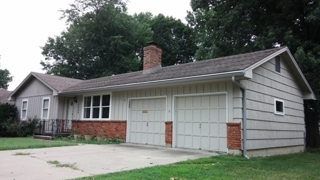 Freestanding 3-car garage on adjoining lot is connected by paved drive. This is a nice 3-bedroom, 2-bath fixer-upper in Evanston Place. The property includes an enclosed back porch, a large backyard, outbuilding and attached garage. No seller's reserve! NWC Old K-4 Rd. & Townsite Rd. Stunning expanse of near pristine Wabaunsee Co. Kansas Flint Hills grass offers tremendous views & ample trees. 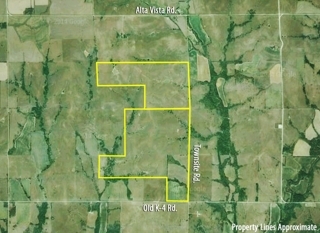 Mostly native grass prairie, perfect for grazing and hunting or scenic home sites, this property allows a rare opportunity. Well Maintained 3 Bedroom True Ranch Sells Regardless of Price! 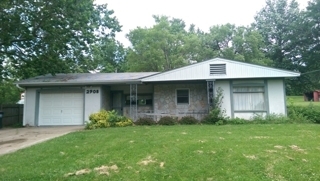 This 3 bedroom, 1.5 bath true ranch brick front home sits in a quiet neighborhood convenient to I-35. Short walk to Penguin park! The spacious living room has a beautiful fireplace and the backyard has a newer storage shed. NO RESERVE! This 4 BR, 2.5 BA true ranch home has it all! Walk to school or the pool! The charming home in the family-friendly Clay Meadows subdivision has a beautifully landscaped yard and the all-season sunroom is a nature lovers dream! NO RESERVE! Solid Brick Front, 3 Bedroom, 3.5 Bath True Ranch, 2 Car Garage, Half Acre Treed Lot, Circle Drive, Fenced Yard, Inground Pool, Platte Woods, Park Hill Schools, 1 Year Warranty, Sells Regardless of Price! This solid ranch offers 3 bedrooms, 3.5 baths, FR w/pegged hardwood floors & brick fp, LR, DR, eat-in-kit., fin. w/o basement, inground pool, 1/2 acre treed lot, circle drive, etc. Could use some updating & TLC. Come and bid your price! Versatile Automotive/Retail/Office Facility in High Traffic Area, 15,750 SF Building on 2.3 Acres Paved with 5 Acres for Expanson, Across from KCK Community College. Sells to the Highest Bidder Regardless of Price! One Owner, Brick Front, 3 Bedroom, 2 Bath True Ranch, 2 Car Garage, Newer Roof, Kitchen with Brick Fireplace, Hardwood Floors Throughout, Sought After Neighborhood, 1 Year Warranty! This solid ranch offers lots of charm, true one level living and is located in a sought after neighborhood in a great location with great schools. Home could use updating. Come and bid your price online or onsite. Don't miss this one!